Todd Sinnott has fired rounds of 74-68-67-72 for a two stroke win over Geoff Drakeford at the The Dunes Medal in Victoria. Dimitrios Papadatos finished in third position at 4-under-par, followed by Michael Williams at 2-over-par. Rory Burke and Jordan Cooper finished in a tie for fifth position at 3-over-par. Sinnott took a four stroke advantage into the final round following a stellar second round of 68, achieved in horrific conditions which he followed with a third round 67 to close the tournament at 7-under-par. “That’s where the difference was with my second round,” said Sinnott. This is Sinnott’s first full season out of the junior ranks, and already the 19-year-old is getting noticed for his solid game and impressive ball striking. During the 2011 US amateur season, Sinnott did not miss the cut in each of the main events he entered – including a top-10 finish at the Players Amateur. “I learnt so much playing in the US,” says Sinnott. Sinnott has won previously, however his victory today at the Dunes Medal is his biggest title to date. Sinnott was the 2009 Victorian Boys Champion and last season he secured top-10 finishes at the Riversdale Cup and Mandurah Easter Amateur. The Dunes Medal is his first main amateur win outside the junior ranks. “It’s special, that’s for sure,” he says. Sinnott certainly has the foundations and ability to become a top-10 world amateur player and progress to the next level. A product of the Victorian Institute of Sport, Sinnott’s game continues to evolve under the watchful eye of Marty Joyce. “I’m working hard with Marty and focusing on maintaining consistency,” says Sinnott. 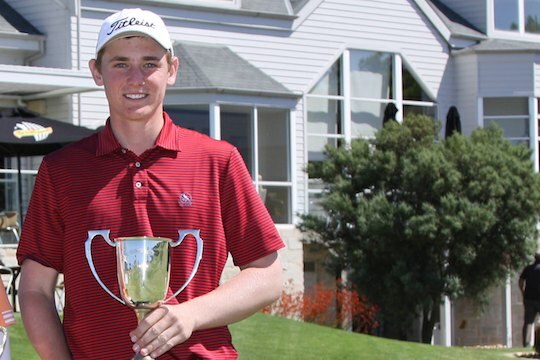 With immediate plans to perform well this Australian summer before returning to the US for his second tour, Sinnott knows there’s considerable work ahead to achieve his goals.